The Newest Rant: Today is my Birthday, I'm 25! 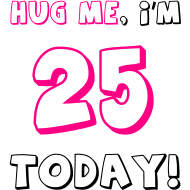 Today is my Birthday, I'm 25! Hello readers of my blog! Today is my birthday and I am officially a quarter of a century years-old! Hooray! I already did a big ol' post of remembering stuff when I hit 700 pieces so I'll spare you the nostalgia. I just wanted to share how it was my birthday so that you could all mentally hug me with your well-wishes. My 700th Post! Also, Free Comic Book Day!